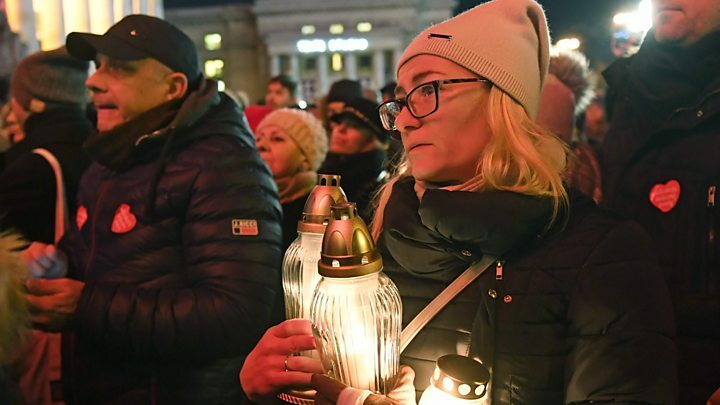 The murder of the 53-year-old liberal mayor of Gdansk, Pawel Adamowicz, has left Poland in shock – and it has raised questions about its deeply divided society and at times toxic political debate. Some of that shock comes from the fact the attack was filmed. 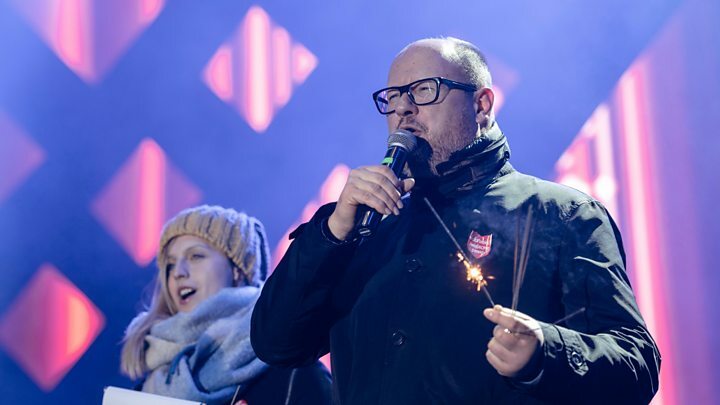 The footage shows a man running on stage and stabbing Adamowicz as he attended a concert for Poland's largest annual charity event, which raises money for hospital equipment to treat children. The assailant paces back and forth, arms aloft like a victorious boxer, still holding the 15cm (six-inch) knife. He grabs a microphone and tells the crowd he blames the mayor's former party, Civic Platform, for sending him to prison. Political violence is rare in Poland. This is the first time a serving high-ranking official has been murdered since the end of communism in 1989. A 27-year-old man from Gdansk has been charged with the mayor's murder. Named as Stefan W, he reportedly has a history of mental illness, and was released from prison last December after serving five and a half years for armed robbery. But there is a feeling that the mayor's murder was not just the result of a perhaps mentally ill man seeking revenge for a perceived injustice. Many commentators are blaming Poland's bitter political divisions and widespread online hate speech. "The assassination of the mayor of Gdansk shows that we have crossed the Rubicon as a society," wrote Boguslaw Chrabota, editor-in-chief of the Rzeczpospolita newspaper, in an editorial. "If there is no systematic fight against hatred we will all have blood on our hands." On one side are those who support the Law and Justice government, with its mixture of conservative Roman Catholic values, euroscepticism and generous welfare hand-outs for families and the less well-off. Then there are those who support the government's pro-EU, liberal or left-wing opponents, like Mr Adamowicz. Using its control of the public media, the government exclusively blames the opposition for the level of hatred in Polish politics. Meanwhile, much of the country's privately-owned media is routinely critical of the government and says Law and Justice is responsible. Adamowicz had come under attack in nationalist and right-wing circles for his support of migrants, LGBT issues, and pro-EU views. Last year the far-right All-Polish Youth group issued a fake death certificate for the mayor, listing the cause of death as "liberalism, multiculturalism and stupidity". Jaroslaw Kurski, deputy editor-in-chief of the popular liberal daily, Gazeta Wyborcza, wrote in an editorial that as the party in office, Law and Justice bore responsibility for restoring dignity to the debate. "Let's stop pretending now. Pawel Adamowicz was the most hated local politician by right-wing government propaganda. On the right-wing forums they didn't stop the hatred, even after his death," he wrote. President Andrzej Duda has called on Poles to show unity in the face of violence, despite their political differences. The tragedy is that it took the murder of a kind and respected man for that appeal to be made.